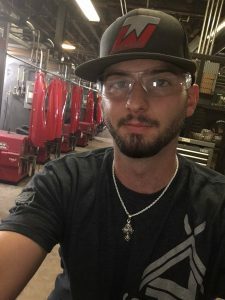 Austin, aged 24 from Jacksonville, Texas, is an instructor for the Welding Specialist program at Tulsa Welding School & Technology Center in Houston. Austin has been teaching here for two years, and he has been in the welding field for seven years. Thanks for your time, Austin. As a kid, what did you want to be when you grew up? Little did I know that I was a much better welder than ball player. I went into high school welding competitions and did pretty well and then went to college for two years and got an associate degree in welding. Tell us more about your welding career. I bounced around several places, different fabrication shops, building anything from small pipe spools to giant pressure vessels. It was really interesting and got my skill level up for sure, and then I ended up finding myself another gig with a pipeline company. They treated me well and paid me real well, but we were doing nothing but robotic welding. You hold what looks like a fancy Game Boy controller and watch the robot do all the work. My job was to operate and maintain the machines, get them back from job sites, take them apart, clean them up, put them back together, fix them if they were broken, and run the equipment. I also taught welders and helpers how to run the equipment, so there really wasn’t any kind of manual welding involved. Is that when you came to Tulsa Welding School to teach? When I left the pipeline company, I really wanted to find myself some plant work. But as they say in welding, “If you don’t use it, you lose it,” and after working with robotics for a few years, I hadn’t been welding for a while. So I wanted to get into a plant doing TIG on some fancy alloys, but I didn’t think I was ready for it. I needed to practice to get better. So how did you go into teaching? The school kind of fell into my lap on accident. I met someone at a dog park who worked at Tulsa Welding School. I told him I was looking for a welding gig and he said Tulsa was hiring. I’d never really thought about teaching, but I thought it would give me the opportunity to practice and get better. When I came here, they welcomed me with open arms. I’ve been practicing non-stop, trying to get better at my craft. After a year, I thought I was ready to leave and get a job at a plant, but little did I know that I would really enjoy what I was doing. It’s that feeling when I complete what, to me, is kind of a remedial task. Then I flip my hood and all these guys are like, “What just happened?” When I explain the concept and see the light go on, when I’m next to them in the booth and it finally clicks when they’re right next to me, that’s pretty cool! So you can see yourself teaching for a while? I don’t see myself jumping out of this gig anytime soon. They treat me well here—a lot better than any shop or company has for sure. They listen to me, work with me, and they praise me! They gave me a welding hood for doing some good work, and that’s not something you experience in the field. I’m going to get my CWI license next and maybe further my career as a certified welding inspector. Just like welding, you don’t get good at being an inspector unless you do it a lot. Being a teacher, I look at 100 welds every day, so I’ve gotten really good at finding problems and understanding how they come about. I can read a weld better than I can read a book at this point. Once you get your CWI, you have to have so many hours looking at welds before you go up in rank, and this 2½ years would count toward that. I don’t even know what I’m going to eat for lunch tomorrow, so I really can’t say. I’ve always wanted to become a certified welding inspector. It’s been one of my dreams since I was in school, so it’s something to knock off the bucket list, regardless of whether I try to find a job doing it. I like excitement and adrenaline. I like to go fast in cars and bungee jump. Anything that gets the blood pumping! If you could have dinner with anyone, alive or dead, who would it be? I never met the man, but my father and grandfather always told me about my uncle. He died before I was born. He was the only other Hargett in my family who didn’t go to the military, and his only profession was welding. 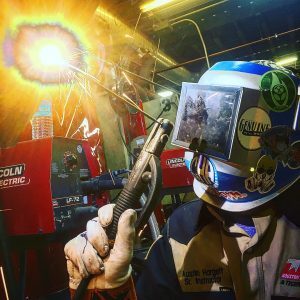 In high school, it was really cool for me to hear that there was another welder in my past, so I’d like to sit down and talk with him. If you got an unexpected afternoon off, what would you do? I’d get out on the lake. I love water sports. Or I’d find a nice track to ride my dirt bike. That’s kind of my thing. I couldn’t do without a good old 12″ crescent wrench. It’s a good hammer, a good wrench, a good spoon if I get a little hungry. It does a little bit of everything! I enjoy TIG welding the most. I’d rather weld on some exotic metals like titanium, aluminum or stainless. It’s fancy and makes pretty colors. There’s not a lot of heat involved and I can sit down and do it! If you weren’t a teacher, and money was no object, what would you be? I’d make art. I like to create things out of metal, and I’d have a lot of fancy, cool equipment to do it, too. If you were to tell someone “Thank You” for helping you become you, who would it be, and why? That’s easy: My father, John. He is definitely my mentor. He taught me to be the person I am, whether it be my work ethic or just morals alone. I don’t think I’ve hardly ever been late just because of the stuff that he instilled in me. It’s just something natural that he’s taught me. He never put too much pressure on me to be the best, but to always make sure that I tried to be. That’s super easy: just put the hood down and weld. Keep your mouth shut and your eyes and ears open. Listen as much as you can, watch as much as you can, and try as hard as you can. Take every piece of advice that you get and put it on that metal. There’s always something you can get better at or something new to learn. I’m 24 years old, and the only reason I’ve gotten to where I am is because of how much I practice. There’s no single “a-ha” moment when you’ll cry, “I’m a welder!” There’s one good-looking bead, but there are a hundred ways to get it there.